Finding the perfect engagement ring should not feel like a chore. Going into it armed with knowledge can help any buyer feel confident about a purchase, especially one this significant. While some prefer princess cut, others prefer round, but not many people are familiar with the Asscher cut engagement ring. The Asscher cut diamond is often referred to as a square emerald cut. Its name comes from its makers, the popular Asscher Brothers. They are brilliant-cut stones made to draw attention to anyone wearing them. Jewelers may refer to it as a cushion cut. This means it is overstuffed, lending to a puffier appearance. The Asscher family gained popularity in 1902 while perfecting their craft. Some of their illustrious pieces can be found as part of the British jewels. The ring is patented. Every unique diamond comes with a family insignia and identification number that is unique to each diamond found within the stone. For about a decade, the Asscher engagement rings where not in circulation, due to the Great Depression. However, they resumed circulation in the mid 1940’s. In the 21st century, the popular engagement ring was redesigned to make counterfeiting more difficult. The purchaser has an option between the vintage and the modern depending on style and taste. Some of the differences include differing facets, to provide a more appealing sparkle, as well as beveled corners. Depending on the era, the engagement ring may or may not be equipped with modern-day precision. This is due to the quality of the technology present in the earlier years of its release. Precision cutting is necessary to achieve the maximal quality of the Asscher diamond. With the “emerald cut” style, it is easy to find flaws and defects so picking the appropriate color is a paramount consideration. When looking for the perfect diamond it is recommended that the length-to-width ratio be between 1.00 and 1.05, although, the buyer should not be looking for that alone; color and clarity play a significant factor in getting a quality product. This type of diamond requires detail and precision. These qualities alone lend to smaller carat cuts. Looking for a large diamond with a “big bling” factor? Buyer beware! Smaller carat sizes are more common for this type of diamond. However, the quality and uniqueness of the stone clearly make up for it. For those who are more concerned with a unique and intricate design and style, then this could be just what the lapidaries ordered! Buyers can feel confident knowing that every purchase is genuine and certified by the Gemological Institute of America. That is, however, if the gem is truly unique. Can it be purchased cheaper? Sure, but it will not be authentic! The four-pronged setting is perhaps the most popular and most common. One common flaw of the Asscher cut engagement ring is that light is not easily reflected off it allowing for a less appealing sparkle. This type of setting allows the stone to be elevated, which, in turn, allows it to attract more light. Another popular style is the pave. This setting is simply brilliant. It coats the ring with a string of diamonds that not only complement the beauty of this diamond cut but also shows off its unique rarity. These tend to use more stones to help accent its beauty. However, the ring is simply stunning on its own. There is no real need to add additional adornments to it. Unfortunately, buyers will not find this astounding diamond at just any old jeweler. However, with recent uprising in popularity they are becoming more and more readily accessible. Sometimes this rarity can be specially ordered to taste so never feel as though you cannot ask about it. Blue Nile offers a large selection of Asscher cut diamonds, all certified and ready to turn the heads of any bride to be. Buy.com – Depending on the budget and the style, buyers can look here to find something eye-catching and pleasing for any taste. Neiman Marcus – This is the place to shop. While the selection may not be as strong as a certified jeweler, the quality and styles are never disappointing. Amazon – While the selection may not be as large as some other “jewelers” the average buyer can find some pleasing items to choose from here. 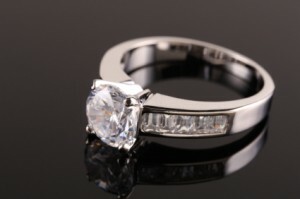 Sam’s Club – Buyers may be surprised that the local warehousing markets are carrying this popular style of diamond. Sam’s delivers a quality product that is somewhat friendly on the wallet. EBay – That is right! EBay is an excellent place to find the perfect diamond. However, buyers should be certain that they are getting a quality and 100% authentic, product. Ask questions. Look for pictures and never hesitate to ask for a verification number. Looking for the perfect engagement ring? Asscher cuts are remarkable pieces of craftsmanship. With their angled corners and stunning depth, there is simply no alternative. Want to make a statement? With this type of cut in circulation for over a century, it is sure to please buyers for years to come. Size – the larger the stone, the more money the buyer will shell out. Quality – while all Asscher diamonds are of high quality, the ones of superior quality will cost a pretty penny. Where the purchase was made – from eBay to Neiman Marcus, Asscher’s can be found in several locations. Do not let someone else’s trash be considered just that. Quality products can still be purchased with a little bit of research. Style – princess to emerald, they have it all. Setting – paves and four-prongs; unique to a style that suits the bride-to-be’s style. Depending on the buyer’s style and budget these beautiful rings can be purchased for as little as just a few thousand dollars. Keep in mind, however, that this will depend on the size of the stone as well as the place of purchase. Have a bigger budget? Some of these breathtaking settings and styles can cost the average buyer upward of $15,000, and it could go higher. Asscher compared to the competition? Say no more. Asscher cuts are not genuinely in competition with other types of cuts. The cut is simply a different technique. The buyer’s personal taste and style should come into play when searching for the perfect engagement ring. Find a site that allows you to tailor personal style with a price to get the perfect engagement ring. In terms of price, it is fairly similar. The size, setting, and clarity will play a large factor into price comparisons. Also, do not forget the place of purchase! The bigger the stone and better the clarity the higher the price will be. Each individual should do their homework prior to determining what stone works best for them. It is necessary to note that the sizes will vary significantly. While a quarter of a carat Asscher will run 3.4 x 3.4 milimeters, a five carat can run as large as 9.5 x 9.5 milimeters. This is a significant difference. Buyers should take into consideration their personal taste. If grandiose and impressive is high on the list, then perhaps the budget can help accommodate this. This is all dependent on the purchaser. Paying close attention to the clarity and unique style of the bride will help to ensure a perfect purchase. If the bride-to-be is petite and not flashy then perhaps making a “large” purchase is out of the question. Pay attention to what they like and what they hint around at. Pay even closer attention to hints and clues and even ask if the question plaques you. Pay attention to the bride-to-be’s style. Do some homework before making a decision. Shop around – shopping around can save pennies and a headache. Authentic – make sure the ring is authentic. Remember that real Asscher rings will come with certification papers and a jeweler will be able to verify the uniqueness of the ring. Purchasing an engagement ring should be a fun and exciting event. It signifies a new life with a new partner and happy moments to come. Asscher engagement rings have been pleasing buyers for a long time and the merchandise just keeps getting better. While Asscher has been around for over a century, the popularity of this particular style and cut is fast rising. Popular stars and TV series have helped to give this cut some notoriety over the past few years. No place of purchase is out of the question as long as the diamond is certified and 100% unique, lower prices should not be scary. Pay attention the quality and clarity to help make an excellent purchase that she is sure to love.